BEP Marine, a Power Products, LLC company and leading manufacturer of system wide integrated power product solutions, recognises technical installer customer growth over the past 12 months. 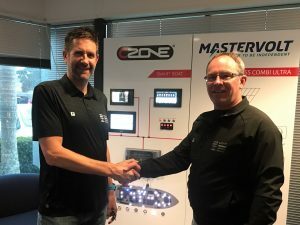 At an exclusive invite event in Auckland, Sales Leader – Doug Anderson & NZ Sales Manager – Mike Conway presented awards for growth and innovation to New Zealand Technical Install Customers. Graham Proctor, Proctor Electrical – Mastervolt System Award, for dedication to the installation of a flagship Mastervolt Lithium-Ion solution. Auckland Marine Electrical – New Installer of the Year, for exceptional first year growth and dedication to BEP Power Products brand products. BEP Power Products recognizes also the ongoing dedication to product and customer support from all of their key customers from technical installers through to OEM Builders and Retail Partners. BEP Marine is a local New Zealand quality manufacturer of durable marine grade products for power management and switching under the BEP and CZone brands for the marine and mobile automotive markets. BEP Marine is owned by Power Products, LLC. Global Marine and Mobile, a division of Power Products, LLC offers the brands Ancor®, Blue Sea Systems, Lenco, Marinco®, Mastervolt, and ProMariner representing a broad product portfolio of electrical components and power management systems for the marine, Recreational Vehicle, Emergency Vehicle, Specialty Vehicle and Industrial markets.